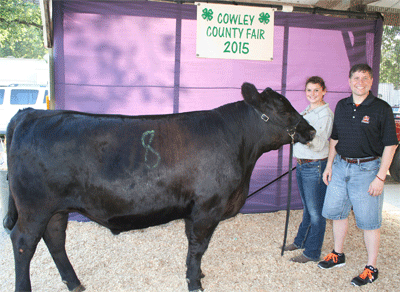 Showing their support for the rural community and agriculture in the county, the Cowley College Foundation purchased a steer during Monday night’s Cowley County Fair 4-H/FFA Market Livestock Auction at the Winfield Fairgrounds. The 1,258 pound steer purchased by the foundation was presented by Malorie Depenbusch, an upcoming sophomore at Udall High School. Malorie is the daughter of Craig and Ronda Depenbusch, and both she and twin sister Miranda both had livestock in the auction Monday night. Malorie has shown animals at the Fair for the past five years and is pleased to know the sale of her steer will go toward a good cause. The meat, which will be processed by the Cedar Vale Locker, will be donated to the Manna Ministries Food Bank in Arkansas City and the Winfield Community Food Pantry to area families in need. Cowley College president Dr. Dennis Rittle and Board of Trustee chairman Dennis K. Shurtz represented the college at the Fair. Ben Schears, vice president for institutional advancement, was also on hand to assist with the purchasing of the steer on behalf of the foundation. The college began purchasing cattle from local 4-H members back in 2010 as a way to not only support local 4-H programs and their students, but also as a way to give back to the community. This year, the Cowley College Foundation stepped in to support the effort. Schears also hopes Malorie and Miranda will consider Cowley College when the time comes to head to college. “They have a couple of years, but when we talked Monday I told Malorie we would be here with open arms to provide a great education,” Schears said.